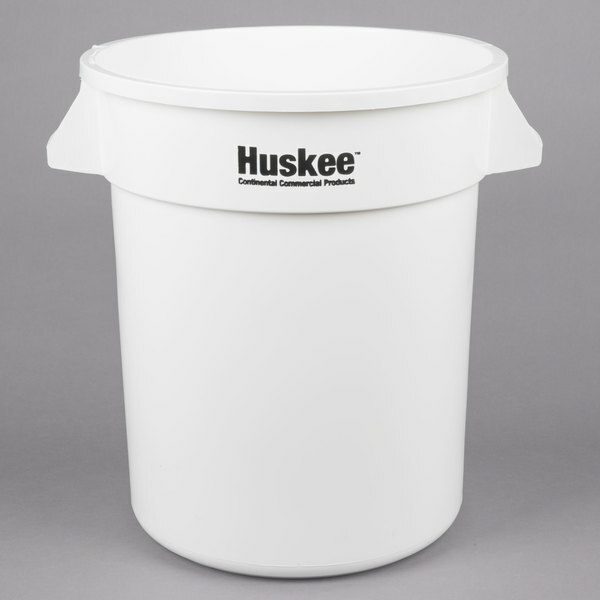 Designed to provide your facility with a strong, durable receptacle that can withstand daily wear and tear, this Continental 2000WH Huskee 20 gallon white trash can is essential for a variety of tasks, including proper trash storage and removal. With a temperature range of 0 to 190 degrees Fahrenheit, this is ideal for cold or warm climates, refrigerated storage, and dry food storage. Made of a high-quality, USDA and FDA approved resin, this material is molded for a seamless construction and bends like rubber to prevent cracking. Additionally, each container is food safe meaning it can be used in both storage or prep applications. 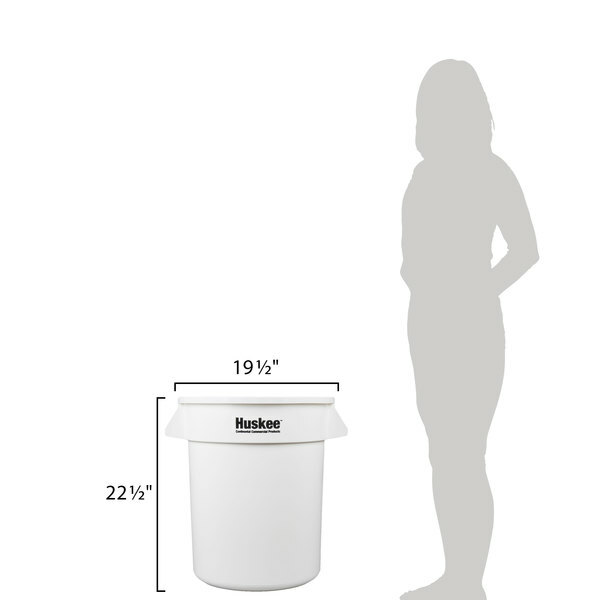 Regardless of whether you need a recycling can, trash can, or large bulk storage container, this can is sure to do the job! 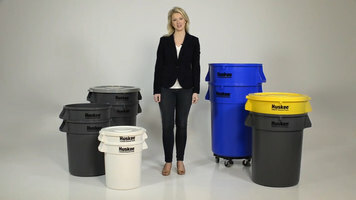 For convenient storage, this trash can nests with other cans when not in use to save space. 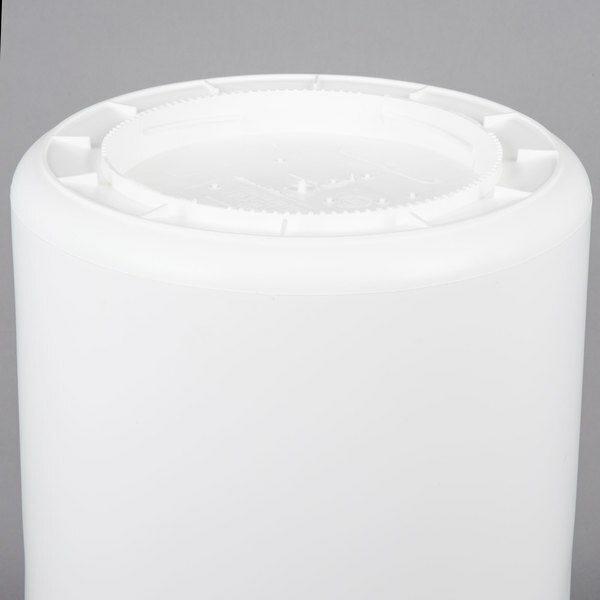 Featuring a reinforced bottom, this durable trash can is made to endure dragging and repeated use. Plus, its heavy-duty handles are ideal for lifting and moving. 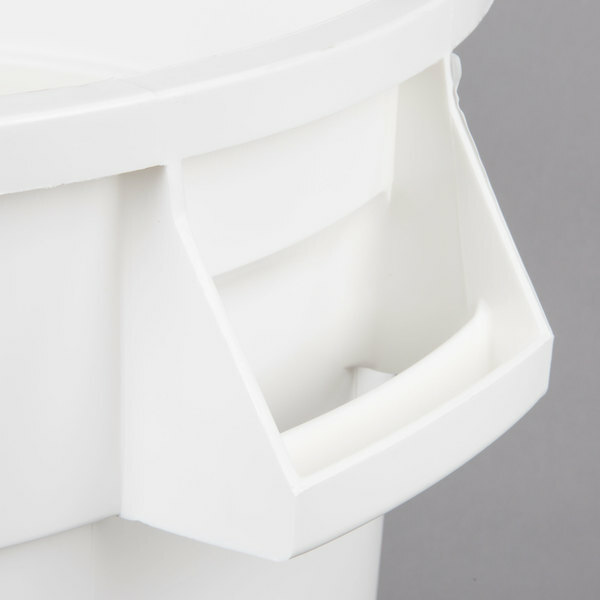 Finally, the bright white coloring helps this trash can stand out and it's great for creating a color-coded system in your kitchen to prevent cross-contamination. Boasts NSF standard 2, meaning it meets the minimum food protection and sanitation requirements for materials, design, fabrication, construction, and performance of food handling and processing equipment in bakeries, cafeterias, kitchens, and pantry units. This is OSHA compliant. they're cute and they're durable. we use these to store our baking powders and corn starch since we dont stock large quantities of it. its clean and I would definitely recommend. Very Great product. Food grade plastics. Makes a super great well restaurant bucket. Thank you, Webstauratstore, for carrying an amazing product, at an amazing price!!! One word...MASSIVE! This thing holds 50 pounds of flour with ease. I looked and compared "ingredient" bins for weeks and settled with these. Not only just a great deal but super high quality too. Five stars for the product. The can itself is super solid and I'm sure it will last longer than the cheaper can it's about to replace. We use the 20 Gallon White trash can in the kitchen of our bakery, we didn't want anything too big and this fits perfectly next to our prep table. durable and easy to clean up, well worth the price. Outstanding. Super strong, made in USA, NSF food grade. Does not buckle when filled with heavy hot 110 deg F. liquid and then lifted by the handles. Lids snap tight. 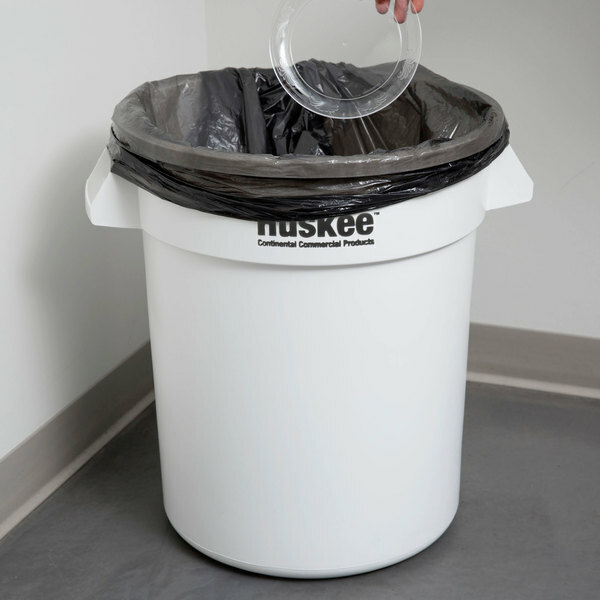 The Huskee Trash Can 20 gallon works very well for us. We don't actually use the cans for trash, we use the cans as storage containers for flour. They seal well and seem to be a quality product. 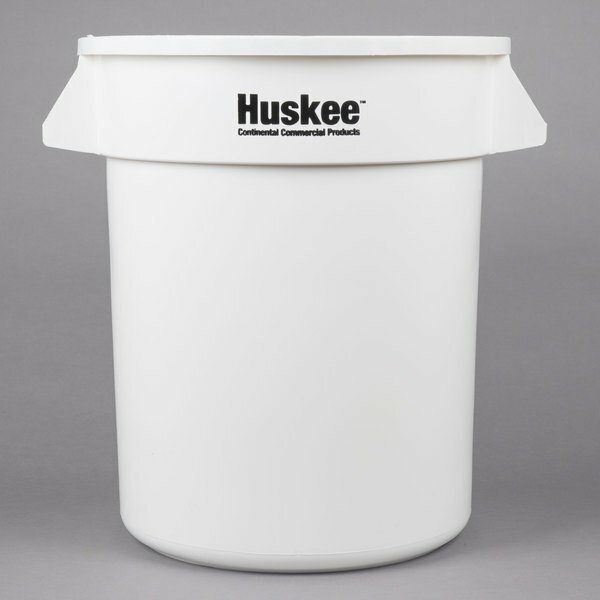 These 20 Gallon White Huskee trash cans are perfect for our needs. We use them to store and protect some of our things. They sit on trash can dollies which makes for easy movement, regardless of one's physical strength. Our company was searching for a large food grade container to mix large batches of drinks or hold large amounts of fruit prepared for the mash mill. It's wide handles make it easy to move about our factory. This trash can works perfectly for my trash bin. I had not been able to find this size in any stores and was happy to find it here. 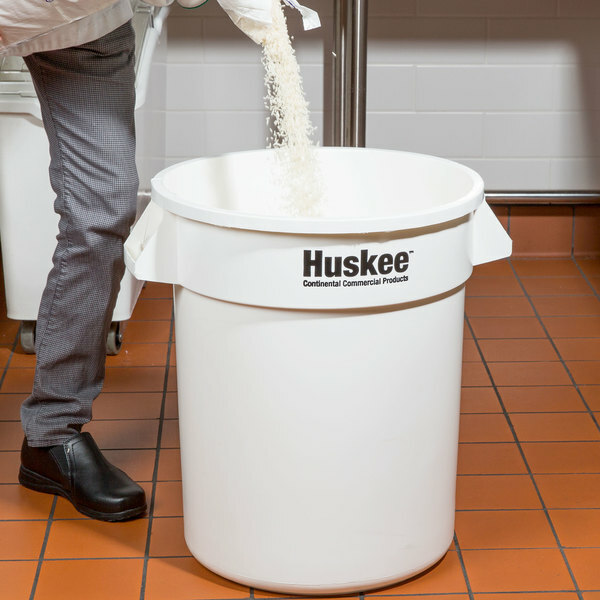 This Continental 20 Gallon Huskee Trash Can Makes A Great Storage Bin With The Lid That Seals,We Store our Sugar, Flower ,and Rice in ours. 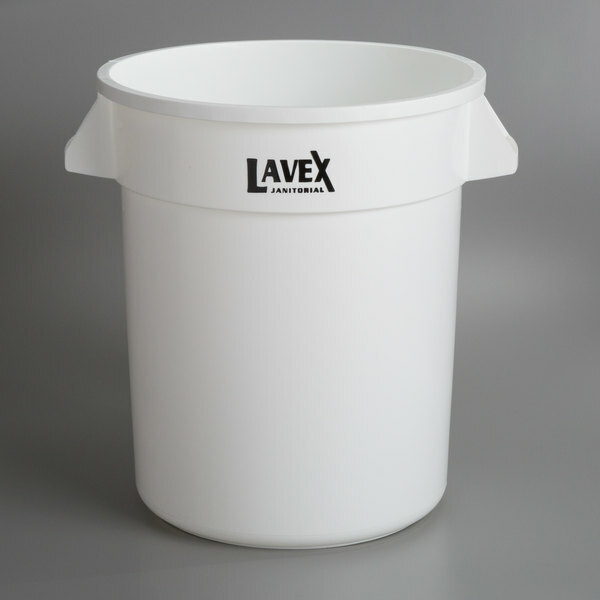 Check out this Lavex Janitorial 20 gallon white round ingredient bin / commercial trash can instead! It is made of a durable resin material that holds up well to the wear and tear of being in a commercial environment. The strong, reinforced handles make for easy lifting and moving from one place to another, without fear of breaking or warping. 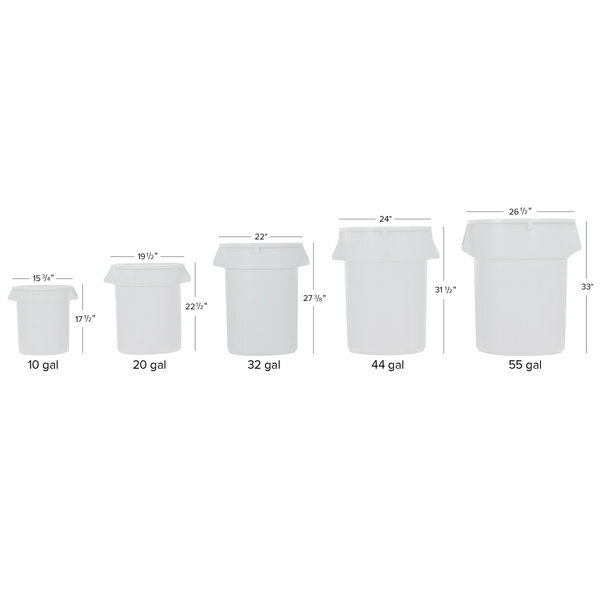 It can also be utilized for bulk food storage, making it ideal for both kitchen and janitorial use.